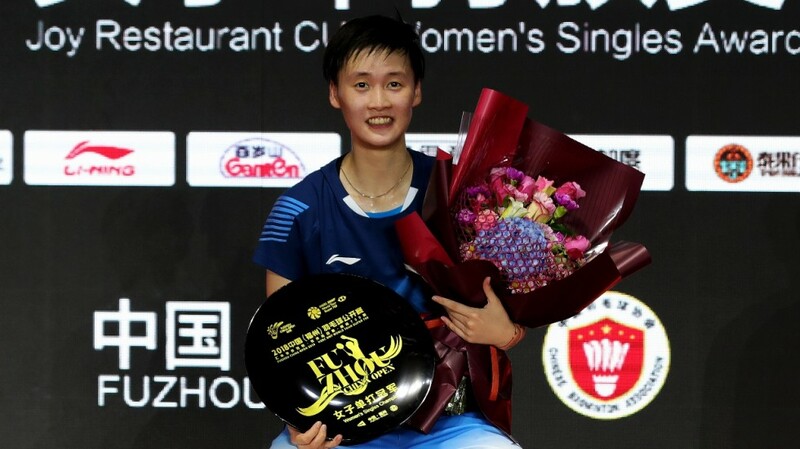 Chen Yufei completed her coming of age at elite level in brilliant fashion today, beating one of the best to capture her first Women’s Singles title on the HSBC BWF World Tour. The 20-year-old (featured image), who has worked her way steadily up the world rankings and has clinically cast aside the top campaigners in establishing herself, celebrated another milestone – with the scalp of Nozomi Okuhara – as she was crowned queen of Fuzhou China Open 2018. Her 21-10 21-16 triumph in front of adoring home fans was as satisfying for the full commitment which she showed to the task, particularly with a torrent of thunderous smashes that left her illustrious opponent for dead, as it was for the sheer delight of collecting the biggest prize of her young career and finally ascending to the top of the podium. As Okuhara – who gave a surprisingly error-strewn performance – sent another shuttle adrift to surrender rather meekly, Chen let rip a throaty scream, perhaps born of the frustration of finishing runner-up four times already this season. Despite her reputation as a tough competitor, Chen entered the Sunday showpiece as the underdog, having never beaten her resilient Japanese rival in three meetings. However, from the outset she was on the attack, grabbing every opportunity to score and, more importantly, to rattle Okuhara who was far from her usually assured self. In the blink of an eye, they were swapping sides and, though Okuhara raised her level, programming remained the same – point after point for Chen who held the lead from 6-6. Increasing in confidence, the No.4 seed punched the air repeatedly as she bore down on a memorable result. “Yes, it’s a mini breakthrough for me. I performed well today. I think I played better in the later rounds. My first two matches were average but, after making some adjustments, I saw a lot of improvements,” said the champion. While Chen revelled in her first taste of the spotlight on the Tour, Kento Momota picked up his fourth Men’s Singles championship this season. The top seed resisted a second-game comeback by Race To Guangzhou front-runner, Chou Tien Chen of Chinese Taipei, to wrest the honours, 21-13 11-21 21-16. As Chou netted the final shot, his Japanese conqueror collapsed on court, having used every last ounce of energy in another successful outing – and a final which showcased some exquisite defence by both players blended with sizzling strokes, amazing angles and deft exchanges at net. Meanwhile, each of the three doubles finals featured a special highlight. 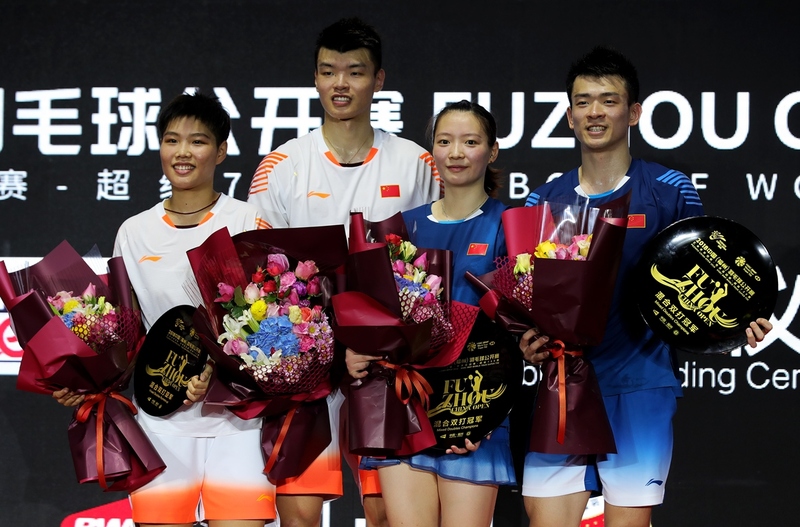 In Mixed Doubles, Zheng Siwei/Huang Yaqiong fought from 17-19 down in the decider to complete “the Grand Slam of Super 750 victories”, according to commentator Gillian Clark. The all-China affair saw Wang Yilyu/Huang Dongping again being overshadowed by their illustrious team-mates who previously claimed Super 750 titles in Malaysia, Japan, Denmark and France before their 21-15 11-21 21-19 success this afternoon. 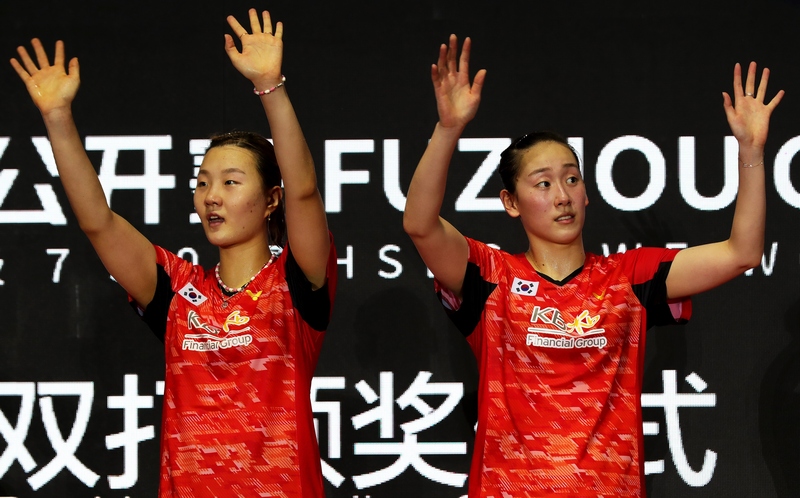 In Women’s Doubles, Lee So Hee and Shin Seung Chan thwarted Japan from celebrating their Super 750 Grand Slam, with pairs from that nation having won the other four events in that category. The Koreans staved off two game points against Mayu Matsumoto/Wakana Nagahara to oust the World champions, 23-21 21-18. Enjoying another amazing season, Marcus Fernaldi Gideon/Kevin Sanjaya Sukamuljo faced their second-straight final versus youthful Chinese opposition, having lost last month’s France final to Han Chengkai/Zhou Haodong. The Men’s Doubles superstars suffered a setback in a thrilling opening game as He Jiting/Tan Qiang seized the lead on their seventh game point. The Indonesians were not to be denied, though, and went into overdrive for the 25-27 21-17 21-15 triumph in 58 minutes. It was a record-equalling seventh Tour title of the season for the world No.1 partnership. “The Chinese were strong. In the second and third games, we were better in anticipating their play and we were ready for their attacks,” said Gideon.